get better only at that which they practice.” – Aristotle. You are cordially invited to attend the Grand Opening of the Atlantic Behavioural Centre. The event will be held at our centre’s new location – 700 St George Blvd, Moncton – Saturday March 31st from 12:00 to 5:00 pm. We hope that you will join us in celebrating this new endeavor. 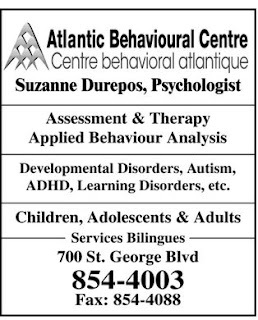 The Atlantic Behavioural Centre was established in 2005 as a private group that consists of a clinical team of administrators, clinical supervisors, psychologists, resource teachers, occupational therapist, behavior therapists, and volunteers. The Centre provides individualized educational programs based on researched principals of applied behaviour analysis to children with neurodevelopmental disorders, namely Autism Disorder and Asperger. The clinic first opened its doors as a private practice in psychology in 1998 serving the needs of children, adolescents and their families in the South Eastern part of New Brunswick. Over the years, this practice has developed a specialization in the assessment and treatment of disorders such as Autistic Spectrum Disorders, Language and Communication Disorders, Learning Disorders, ADHD, Oppositional Defiant Disorders, Conduct Disorders, and other disorders of childhood development. We are very pleased to be able to increase the services provided and are committed to raising the bar in the treatment of autism. We look forward to seeing you at our Grand Opening. Suzanne Durepos, M.A.Ps., L. Psych.